Basquiat paintings regularly fetch tens of millions of dollars, and the recent sale of a little-known Da Vinci topped $450 million—but what forces are driving the white-hot art market? Who assigns and who pays these astronomical sums? What currency adequately measures art’s value? 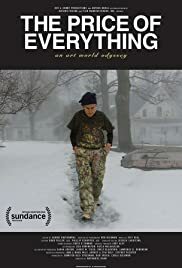 The captivating new documentary THE PRICE OF EVERYTHING takes the audience on a thrilling art ride – into a rarefied labyrinth of galleries, studios, and auction houses to wrestle with these questions and explore what society loses and gains when art becomes a rich person’s commodity. As the film opens, the voiceover announces as an art auction takes place that art and money go hand in hand and that good art should be expensive. Only if something has great value will it be protected. The scene ends with a Basquiat painting sold at $8 million. One of the pleasures derived from the film is the wide assortment of art on display. This pleasure does not come from paintings alone, but from sculptures and other artifacts. One of the most famous is the Jeff Koons rabbit , a stainless steel bunny that on staring in, reveals a grand display of other art pieces. The film also contains interviews from two prominent groups – the artists (including art celebrity darlings like Jeff Koons, Gerhard Richter and Larry Poons) and the art collectors. Gallery owners and art dealers form the other interviewees outside these two groups. This results in is one of the most insightful documentaries about art. This is not to mention the dozens of priceless paintings on display on the screen, together with an estimate of their worth. Director Nathaniel Kahn (Academy Award nominee for his 2 documentaries, MY ARCHITECT and TWO HANDS) always keeps the film on track – the price and value of art. The film considers all kinds of justifications for the price rage on paintings (including the economic forces of supply and demand) always reminding the audience the notion that a work can only really be considered important if it has cost a small fortune. Kahn is also clear to emphasize the fact that a painter is usually very poor with only 99.99% making it rich. An artist paints because he or she wants to. A collector wisely compares the price of art like the price of stock in the stock market. One has to be constantly keeping track on things, with price fluctuations rising as much as the crazy stock market. Included is a valid debate on the subject of whether a famous painting be kept in a museum or private home. The gallery owner obviously says that it should not be in a dark place like a museum but then at least all people rich or poor would have equal access to see them. At the end of the film, a wealthy and successful collector Stefan Edlis donates two rare paintings to a museum, the reason he gives is that he has no grandsons. THE PRICE OF EVERYTHING is a pleasure for those interested and familiar with the art world. But it also proves an educational and informative source of information for the others.